Florence provides one of the most rewarding of European city breaks, and hardly needs the additional publicity from UK Prime Minister Theresa May’s speech on Brexit there today (September 22, 2017). And yet her appearance does serve a purpose, in underlining the universal and eternal appeal of great art and architecture, and questioning the wisdom of erecting barriers that might make it harder for us to see and appreciate them. A shorter version of this post appeared in the Mail on Sunday, December 27th, 2015. Many cities are merely lovely. With such a wealth of Renaissance art and architecture, including Michelangelo’s David, the Ponte Vecchio and the terracotta splendour of the cathedral, Florence rises above them all. I was swept off my feet by galactic-class treasures. Opening a new gallery in Florence, already blessed with so much fabulous art, is a bit like adding an extra dish to a 12 course banquet. But the new Museum of the Opera del Duomo (it opened in October 2015), on Via della Canonica by the cathedral, contains a wonder worth a place on any visitor’s list. It’s the actual-size reconstruction of the original facade of Florence Cathedral, 115 by 66 ft. They put back its original statues, in storage for centuries, following a 16th-century drawing. The facade was part of architect Arnolfo di Cambio’s first,1294, vision for the cathedral. But, never properly finished, it was removed in 1587.The museum also displays sculptures and original works of art made on the site by Florentine masters for the cathedral, many on show for the first time in 500 years. There was a recent and interesting observation on a long-lost feature of Florence in a temporary exhibition at the National Gallery in London. It looked at Francesco Botticini’s Assumption of the Virgin, an altarpiece once installed in the church of San Pier Maggiore, almost entirely destroyed in the 1800s. Centrepiece of the exhibition, ‘Visions of Paradise’ , was Botticini’s painting, which includes a panoramic landscape of Florence and an extraordinary dome of Heaven, filled with saints and angels. There were also related paintings, drawings, prints, manuscripts, ceramics, and sculpture. A short film explained recent researches by academics from Cambridge and the gallery to find the site of the church and to make a virtual recreation of it. Michelangelo sculpted the literally superhuman 14 ft high statue of the Biblical hero David between 1501 and 1504, while only 26. It is a supreme creation of the human mind, and hand. The plan had been to set the white marble statue (it depicts the hero, unusually, before the battle with Goliath) high up on the roofline of the cathedral, alongside other figures.Too massive, and too perfect, to be lifted there, the colossus stood in Piazza della Signoria for 300 years, before being moved into the Galleria dell’Accademia in 1873 (one of many copies replaced it). It was restored and cleaned to its Renaissance magnificence in 2004. Sadly, they have found micro-fractures in its legs. More work, or another, earthquake-proof location may be necessary. We walked straight into the Uffizi in October, although do buy online before your trip (http://www.uffizi.org) in the busy spring and summer months. It’s almost worth walking at random, for that extra shiver of thrill when you unexpectedly come across Botticelli’s Birth of Venus and Leonardo’s Annunciation. The other, equally majestic, collection is in the vast Pitti Palace, on the south side of the Arno. There are many sublime paintings by Raphael, Titian, Lippi, Caravaggio and Rubens. You could spend a day in each. The Medici Tombs is the opposite. Just two chambers and you can see them in 30 minutes, but such ravishing sculptures to adorn the sepulchres of the greatest of all patrons of the arts. The work, once again, of that unparalleled genius, Michelangelo. We crossed the Arno over the Ponte Veccio, that unique, ancient, combined jewellery and gold shopping centre and river crossing, for the quietest walk in the city. Heading up the Via di S Leonardo (it’s on Google Maps), we saw two cars and no other pedestrians (it was October). 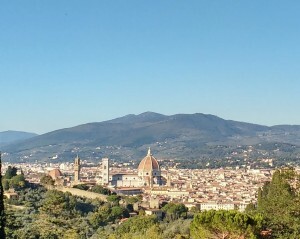 After a coffee at the top of the hill, we circled back, down Viale Galileo, to a viewpoint all to ourselves for that famous aspect of Florence. We curled around the Abbazia di San Miniato and the Chiesa di San Salvatore. Deserted again. Only then did we meet actual people, puffing up the hill to the Piazzale Michelangelo, with its bronze replica of David, where everybody takes those photos of the cathedral in a sea of terracotta roofs. Florence can be crowded, although new city centre pedestrianisation makes walking the central squares much easier. (Try to miss the hot summer months – October to March are best.) We stayed outside in cheaper accommodation in one of the many Tuscan hill towns, Montaione, an hour’s drive away. Google Maps (covered in our £4 a day phone roaming deal) guided us in. We parked (free) at Scandicci, near the end of the tram line – €5 for a 24 hour ticket. Alight at the main railway station, and it’s a short step to the historic centre through the wide Piazza di Santa Maria Novella, past the ornate basilica of the same name. Fancy a coffee to start the day? Order at a cafe’s counter for the lowest prices – pay when you leave.